Puerto Ricans could be the Sunshine State's swing vote. MIAMI — Grisel Robles arrived in Miami in late September, after Hurricane Maria flooded her house and wiped out the life she and her family had. Starting a new job and rebuilding her life, along with her husband and 6-month-old daughter, has left little time to focus on politics. But she is taking note of one aspect of the political landscape. "I have noticed who is defending our rights as Puerto Ricans," she said. While Robles expressed disdain for President Donald Trump because of the administration’s response to storm-ravaged Puerto Rico, she praised Gov. Rick Scott of Florida, a Republican, for his efforts in helping settle Puerto Ricans displaced by the storm. But she also likes Sen. Bill Nelson, D-Fla. She met him and called him "a humble and accessible man." Scott is expected to enter the 2018 Senate race against Nelson, and early polls have them in a dead heat. It could very well be that Puerto Ricans like Robles are the deciding factor in that race and a number of other key races. Since they may not be as familiar with local and state political parties — Puerto Ricans who live on the island vote in elections there — they are becoming a potential group of swing voters who can have a real impact on upcoming elections, according to some experts. As American citizens living on the island, Puerto Ricans cannot vote in presidential elections and can send only nonvoting representatives to Congress. But once they make the move and are living on the mainland, they only need to register to be eligible to vote. Politicians from both parties are taking note. “Puerto Ricans in Florida, just like the state, are a swing population. By that, I mean they are issue oriented,” said Edwin Melendez, director of the Center for Puerto Rican Studies at New York’s Hunter College. So far, over 189,000 Puerto Ricans have migrated to the state after the hurricane left unimaginable destruction throughout the island. Planes arriving from Puerto Rico remain full and some estimate as many as half a million people will eventually make their way to Florida. Although some, particularly the older generations, will eventually return to the island, experts believe most will remain here. Central Florida is their preferred destination, but areas like South Florida and Tampa are also seeing an influx of Puerto Ricans. They are joining over 1 million who already live in the state, many of them coming in recent years fleeing the economic crisis on the island. At the rapid pace the population is growing, Puerto Ricans will soon displace Cubans as the largest Latino group in Florida. Puerto Ricans are an attractive group of voters because of their high participation rates and their ability to group together as a voting bloc, like they did during the 2016 elections. Melendez calls them “a swing voting bloc,” similar to how Cuban-Americans once were. But Melendez thinks Puerto Ricans voted overwhelmingly for Hillary Clinton in 2016 because of the negative comments Trump made about Mexicans during his campaign and the fact he was seen by many as anti-Latino. Trump went on to win the state by a mere 112,000 votes. In 2016, Rep. Darren Soto, a Democrat, became the first Puerto Rican from Florida elected to Congress. He calculates that Florida Puerto Ricans have been about 50 percent Democratic, 25 percent Republican, and 25 percent independent. “We’re definitely a constituency that you have to earn," said Soto. The freshman congressman doesn’t take any votes for granted. “We are specifically making sure to help the new arrivals with all these new constituent issues, from enrolling kids in school, to housing, to health care and food assistance,” he said. Because political parties in Puerto Rico differ from the ones on the mainland, it takes for newcomers to figure out the ideologies and decide on whether to join a party. When registering to vote, many check off the box that says NPA, or No Party Affiliation, and then change it once they get a grasp on the politics here. Republican state Rep. Bob Cortes, who is Puerto Rican, said the same thing happened to him when he moved stateside with his wife and their child 32 years ago. “People have been very angry at Trump and at the Republicans and the way Puerto Rico has been treated with the hurricane disaster, so I think that’s going to be an important factor,” Falcón said. That hasn’t kept political figures like Scott from courting Puerto Rican voters. 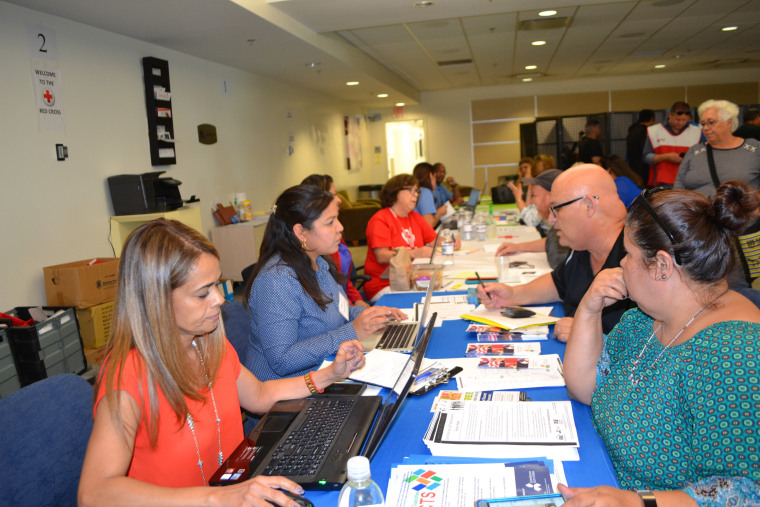 In October, Scott set up disaster relief centers in Miami and Orlando to help arriving Puerto Ricans get settled. He made it easier to enroll kids in public schools by waiving the documents normally required and he also asked colleges and universities to offer in-state tuition to Puerto Rican students. Groups like Mi Familia Vota are planning to register Puerto Ricans and other Latinos to vote in January. "Mi Familia Vota Florida plans to register upwards to 25,000 Latinos to vote in 2018 and expects at least half of those registered to be of Puerto Rican descent," state director Esteban Garces said. The 2018 Florida elections include governor, U.S. Senate and Congress. For Robles, rebuilding her life in Miami is a priority at the moment. It will still be awhile before she learns to navigate the political sphere. “Right now, I don’t know who I would vote for,” she said.